Here’s a question for all you commercial installers out there. When you are wiring a new building, how many lines are you running from the roof? In the past you would be just fine running just four, but today’s AT&T commercial standards say seven. That’s right, seven. That’s a lot of copper. Let’s look at why you need so much. 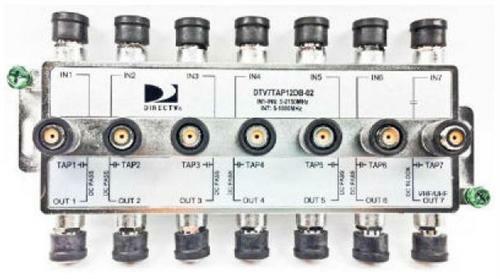 Ever since DIRECTV went to high definition in the mid-2000s, the standard has been four wires. To put it simply, two wires carried the standard def stuff and two carried the high def stuff. (Don’t kill me in the comments, I know there’s more to it than that.) Four wires sufficed for any installation unless it included an international dish or a TV antenna. A bundle of four RG6 cables is about the thickness of a half-dollar, and that can seem like a huge amount of space in a conduit or crawl space. It can be awfully hard to get that amount of cabling down from the roof but you always knew it had to be done. Sure, there are solutions that let you use fiber but they’re super expensive and not worth it for most installs. It was actually about four years ago that I heard a higher-up say that all commercial installs should have six runs from the roof. Back then it was hard to know exactly how all of it was going to work but today it’s obvious. DIRECTV’s newest satellites use something called “Reverse DBS” to give themselves more capacity. Right now that’s being used for 4K but it could also be used for HD if needed. In order to get these frequencies, commercial customers should be using the Reverse Band Legacy Slimline 5 LNB. This is the new standard LNB for all commercial installs. You should use it 100% of the time. Yes, it will pick up those old standard definition signals on the 119 satellite but more importantly it will pick up the new reverse band signals. It’s very possible that due to channel ads or unplanned problems, a large chunk of programming could move to the “Reverse Band.” DIRECTV channels move from satellite to satellite all the time and your customers don’t realize it because their dishes pick up every signal they need. You want to keep it that way. So, it is my advice to all commercial installers that you put in the 6-wire LNB and run six cables from the roof from that LNB into a SWM-30 multiswitch. This isn’t “futureproofing.” It’s just “todayproofing.” A customer who tells you that 4K isn’t on the roadmap for them still needs to know that they may need those frequencies. That’s right, the official AT&T standard says seven wires. You could use that last wire for over-the-air antenna, for the international dish, or for CMTS (cable internet.) But even if you’re not thinking of those things, you should run seven wires. Why? Because, you know it’s a pain in the neck to get into the riser room or through the ceiling. Just run an extra piece of coax because “it happens.” Connectors go bad or there are insect or rodent problems and even if that’s not your fault, your customer will call you and expect you to fix things FAST. Don’t waste a lot of time climbing around while the customer is waiting. Get them back up and running then come back when the heat is off and replace that faulty line. Yes, I do understand that copper costs money and that a bundle of seven lines is pretty thick. I do get that. But planning for the future only makes sense and making sure you can get your customer up and running fast makes even more. So get the install done right the first time, and chances are you’ll see the wisdom of AT&T’s standards soon enough. Can you get a universal remote that works with DIRECTV perfectly? Is DIRECTV abandoning the Ku band?